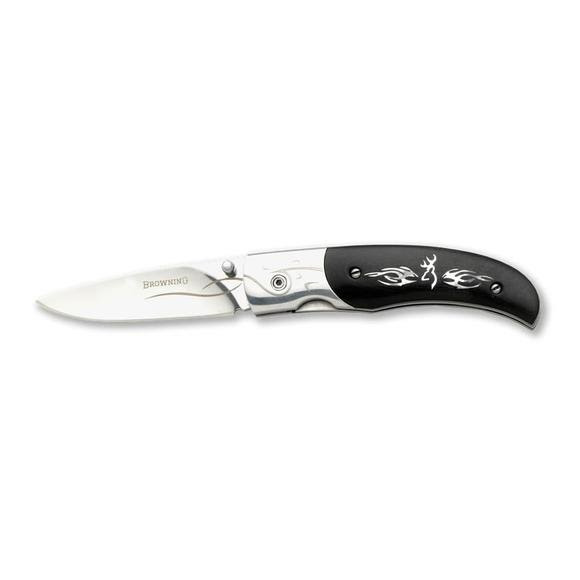 The Buckmark Art Knife features a Micarta handle features Mother-of-Pearl Buckmark Design and a Razor Sharp Stainless Steel Blade, perfect size for pocket or purse. For nearly 30 years Russ Kommer has earned his living as a highly respected big game hunting guide in Idaho and the wilds of Alaska. The work of a guide doesn&apos;t end with leading clients to trophy game animals; it starts there. Once an animal is on the ground the real work begins. Over the years Russ used many knives to dress and skin countless animals, yet found each knife lacking in performance. He drew upon his wealth of hands-on experience and started designing and producing his own knives. It turned out that Russ had a knack for this art and has become a talented, award-winning knifemaker. What started as a hobby and the search for a better blade has led to numerous best-in-show awards. Russ creates and personally field tests his designs to ensure they meet the toughest standards - his own. Browning is honored to team with Russ to produce many of the knives we offer.